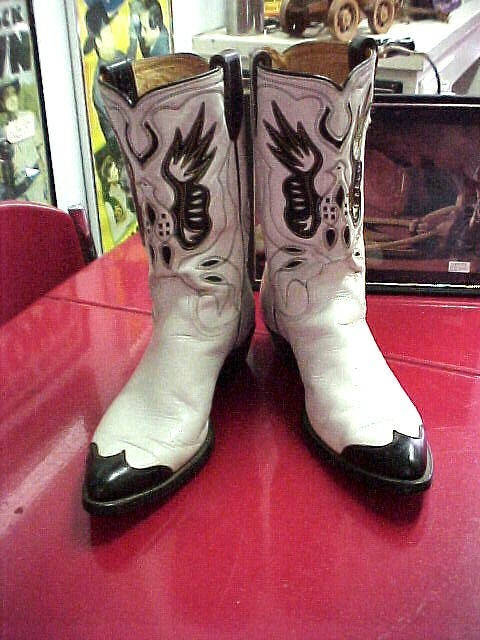 Here are a beautiful mint pair of Vintage 1940-50 White Cowboy Boots with inlaid Eagles that came from the Marty Stewart Collection at Auction about 10 years ago. Size 10. They may have belonged to Roy Rogers. He had a pair just like them. But no evidence. Here are a beautiful mint pair of Vintage 1940-50 White Cowboy Boots with inlaid Eagles that belonged to Country Singer & Star Marty Stewart (Tennessee Charity Auction). Size 10. Roy Rogers had a similar pair. Collectible / or wear them. Please email cowboycabin@centurytel.net with questions or call 406 270-2842.